So like last week...or a few weeks ago on xat me and Tim (DestinyBuizel) decided to make our own Kirbys for fun and maybe we might use them someday. But all of a sudden everyone on the chat started making their own Kirbys so I decided to make this thread. What if you don't have a Kirby or want to make your own? No problem there's 2 games from Spriters Resource with the best ones! Add your own stuff to them like tails, wings, tatoos, or even a new weapon! 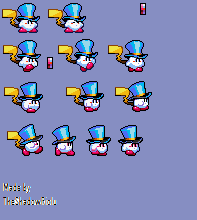 Now go ahead and post your progress ^_^ and don't steal other's sprites please and thank you!